Author Written by Janelle Swanson and last updated on Posted on June 3, 2017 . Posted in Categories All Things SAP, SAP Career. Implementing SAP involves a high level of change management across all hierarchies of an organization. For this, change agents are identified. These are team members who have in-depth knowledge and expertise in their respective domain. They are opinion leaders and can drive transformation by keeping an organization’s overall culture in view. Arguably the most dynamic role on this team is the SAP Business Process Owner. SAP does not follow the plug-and-play archetype where a software is designed on an industry’s best practices, gets installed on a server and, like any other user-friendly software, users get acquainted with the software on their own. Implementing SAP also brings an overall change in the organization’s environment. Users are accustomed to their traditional style of working where every department works in silos and are not connected with each other in real-time. As an example of the traditional model, the purchasing department receives a requisition for a product from the procurement department. Procurement sources the product on negotiated rates and delivery times. If the procurement department doesn’t inform the warehouse that the said product shall be delivered with a said quantity on a said date, when the goods arrive the warehouse has no idea whether the quantity being supplied is on-time, over the allotted quantity or a partial delivery. The same situation occurs with the accounting / finance department, if they are not intimately connected with the purchasing team, they receive the bill from the vendor and are expected to pay without being aware of the agreed rate and quantity delivered and have to rely on the vendor’s documentation. SAP transforms a business not only with respect to processes but also by impacting the organization’s culture and environment. Departments previously working in silos get integrated. One department becomes dependent on another. For example, in an integrated SAP environment, if goods are received that are bound for quality check before being moved to stock, until the QA team has entered a quality inspection in the SAP Quality Management module, goods movements cannot be performed by either production or warehouse. Integration, with all its blessings, can also bring friction among people and personalities. If one department doesn’t perform its function in time, the activities of subsequent departments get hampered. In this section, we shall discuss the role of business process owner, a person who is not only involved at the time of SAP implementation but is also part of continuous business process improvement after the implementation of SAP. A business process owner is well versed with the company’s business processes and has deep insights on industry norms and best practices. This person also has awareness of how competitors perform their business operations. In order to become a successful business process owner, a person should possess a strong background and have deep business knowledge and insights. They should have an influential personality to get their ideas across, relatability among all levels of an organization and a willingness to get the job done. They should be pragmatic, understanding the realities of the job and the environment in which users perform their functions. They should also be sensitive to the cultural, political, demographic and education level of users as well as their potential reaction to change and how to manage it. A business process owner needs to be an active decision maker. Given any environment, scenario and situation, their responsibility is to make decisions taking into account the best interests of the organization, the comfort of the users and the viability of executing the decision. 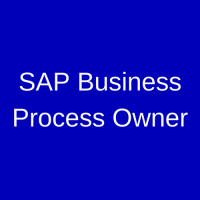 During an SAP implementation, a business process owner is aware of AS IS business processes while the SAP implementation partner proposes TO BE business processes. The business process owner compares both AS IS and TO BE to identify gaps and additional business needs. These gaps will either be incorporated in the SAP environment as enhancements or engineered into an alternative business process for the end user. In the former case, the business process owner must get buy-in from management to pay for the enhancement. In the latter case, the business process owner must get buy-in from the end user to adopt the process change. A business process owner also acts as a liaison between the SAP implementation team and the business team. There may be situations where mediation is required if conflict arises amidst departments or teams during the stressful implementation cycle. It is up to the business process owner to remove all barriers to the implementation, thus the task falls on him/her to soften the conflict and keep the project moving. Once sign offs are received for the implementation blueprints and process designs, the business process owner must monitor whether the system is being built according to what was discussed during the design phase. If there are any deviations, they must identify them, escalate to the appropriate party and get the build back on track before there are any implications to the project timeline. In short, a business process owner is a visionary leader with expert-level knowledge of both business processes and SAP. The role of the business process owner does not end with the implementation and delivery of SAP. This is a perpetual role as new business processes are identified and as the business grows. With growth comes new challenges. The business process owner should have a hunger for continuously improving. Their role is to make users’ lives easy while increasing their organization’s overall efficiency and effectiveness.